Now that all my family and friends have become hash-assimilated (resistance is futile), new hashcapade recommendations pop up all the time. The most recent suggestion came from Lisa’s coworker who mentioned Toast. After I dutifully added it to my list, I checked to see if Toast was on twitter and found them, @Toast_PDX – instant follow. That very same day, I saw this tweet: “Creme Fraiche Coffee Cake. Orange Chocolate Muffins. Pomegranate Orange Mimosa. Pork Belly Hash. It’s a good day! #pdxeats #pdxdrinks” Suddenly, my day had purpose and meaning, but more importantly, a brunch plan! Much to my chagrin, a calendar glitch made it impossible, but @Toast_PDX assured me that they’d let me know the next time hash was on the menu. 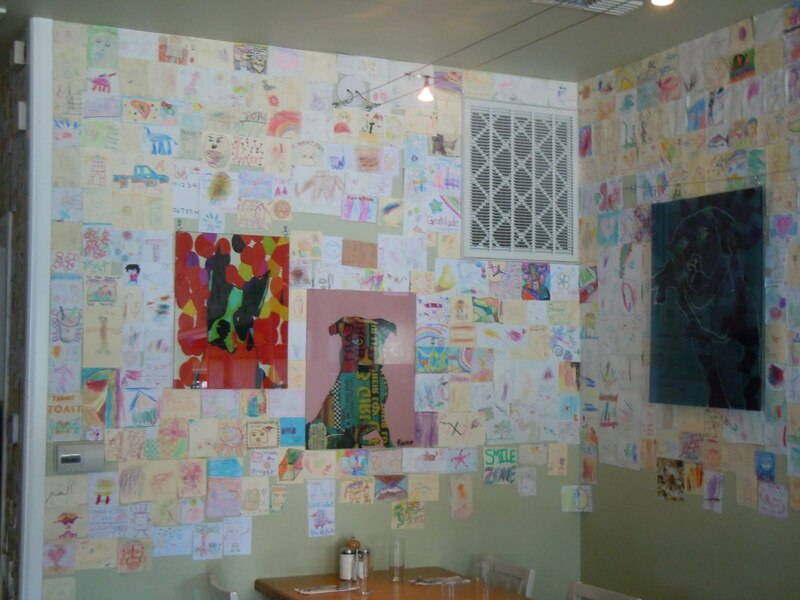 Diner-supported art makes Toast friendly to all Picasso wannabes. Well, shut my mouth and damn my eyes! 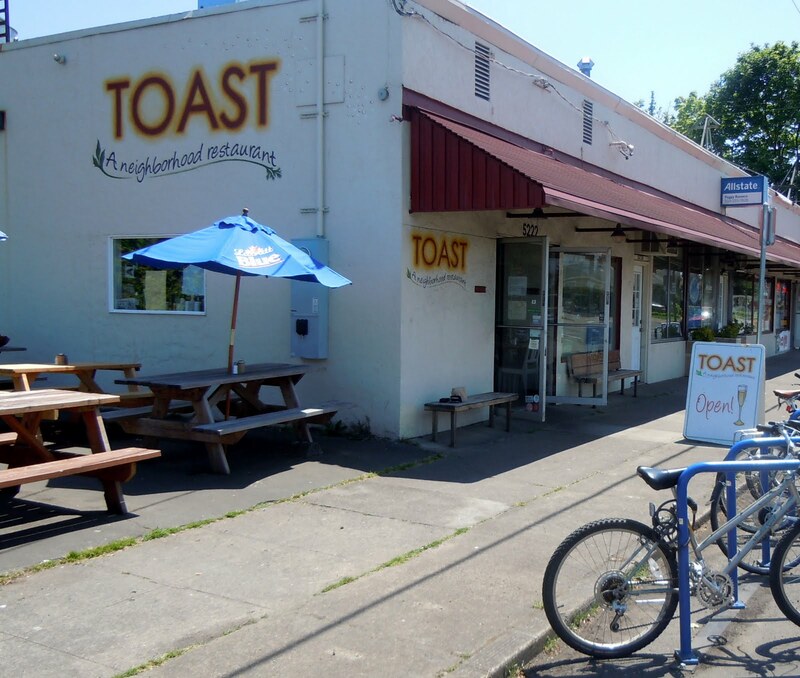 The very next day, @Toast_PDX tweeted me: “-Bacon Hash today – FYI.” Talk about the power of social media! I felt like Toast was my new best friend and that they understood and accepted my hash obsession! This impromptu hashcapade was on!!! As luck would have it, Toast’s owner, Don Kotler, was there and we chatted about his awesome marketing weapon, @Toast_PDX. He was clearly tickled at my unbridled enthusiasm for my personal invitation to a Bacon Hash hashcapade. Thank you, Lindsey!!! Virtual hug [ ]. 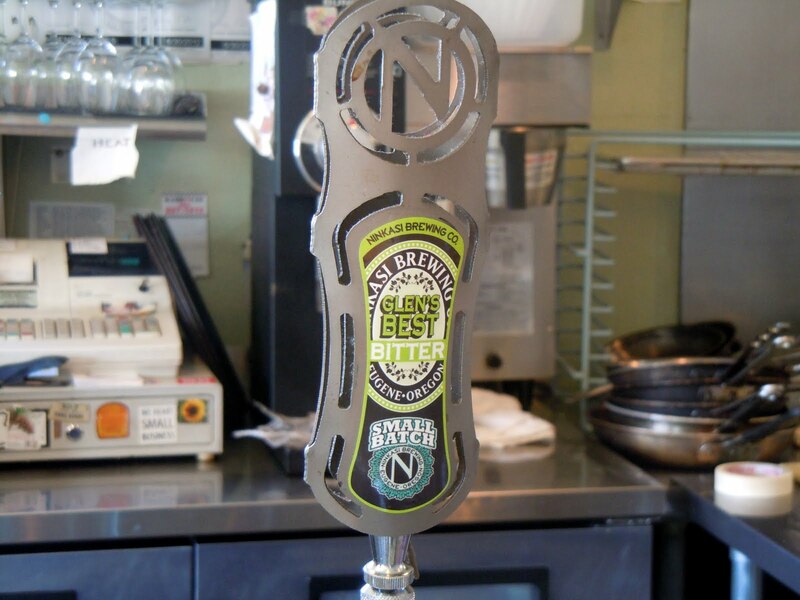 Beer tap tempted me the entire meal – wish it had been the weekend! And so, a mere 2 weeks after my Bacon Takedown win for Bacon Hash, the most delicious, wholesome and delightful bacon hash from Toast arrived. I was blown away by the imaginative combination of ingredients: pickled red onion, collard greens and carrots with perfectly pink bacon (parboiled & fried briefly? 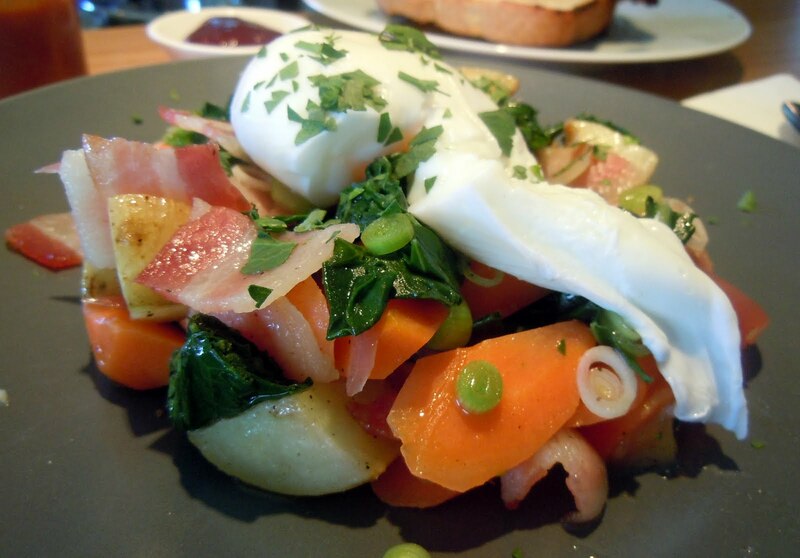 ), roasted potatoes, all topped with a poached egg. Kai offered the house-made hot sauce which rocketed this hashcapade to the stratosphere – I was in heaven! So, I’d like to propose a toast to Toast: Here’s to the most twitter-friendly restaurant in Portland, their amazing staff and their awesome hash!